PRE-ORDER THE BOOK AT ANY OF THE RETAILERS BELOW. Sign up with your email address to the latest updates about the book and the Risen Motherhood ministry. Give the r|M book as a gift today! While “Risen Motherhood” doesn’t release until September 3, 2019, you can give it as a gift today! Below you’ll find a free download for a printable you can tuck inside a card to let someone you love know you’ve purchased the book on their behalf. 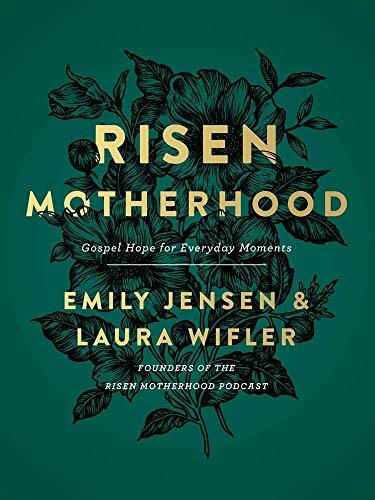 Emily Jensen and Laura Wifler are the cofounders of the Risen Motherhood ministry and cohosts of the chart-topping podcast. They are also in the trenches of motherhood, right alongside their readers. With a combination of accessibility, relatability, and solid biblical knowledge, Emily and Laura have a knack for simplifying complex scriptural truths, relating and applying them to everyday life. God has consistently and powerfully used the voices of these two moms to captivate women around the world with the gospel. As sisters-in-law, Emily and Laura both live in central Iowa with their families. "MOMS FIND EMPATHY, ENCOURAGEMENT, AND THE REMINDER THAT TRUE HOPE FOR MOMS IS THROUGH THE TRANSFORMING WORK OF THE GOSPEL, ALONE." "Risen Motherhood delivers practical and present wisdom, anchored to timeless biblical truth. In Risen Motherhood, moms find empathy, encouragement, and the reminder that true hope for moms is through the transforming work of the gospel, alone." "THIS WONDERFUL BOOK OFFERS DEEP SYMPATHY AND UNDERSTANDING TO THE STRESSES AND CHALLENGES FOUND IN MOTHERHOOD." "THIS GEM OF A BOOK EXPLORES HOW GOD IS USING SIPPY CUPS AND PLAY DATES FOR HIS GREATER PURPOSES." "I HAVE SEEN MANY CHRISTIAN MOMS I KNOW AND LOVE READ THEIR WEBSITE, LISTEN TO THEIR PODCAST, AND GROW THROUGH IT." “It’s easy to find friends who are quick to offer their opinion and advice. It’s a lot more rare to have friends who will point you back to the truth of the Gospel of Jesus. "LET THEM REMIND YOU THAT THE LIGHT OF THE SON HAS DAWNED AND YOU WALK IN THE WARMTH OF A RISEN MOTHERHOOD." "Emily and Laura don't just want you to know the gospel. They want it to sink deep into your mind and heart so that there isn't one tiny corner of your life that isn't changed and made new by Jesus. This book is a fresh reminder for weary pilgrim moms that you are journeying to the Celestial City and your name is no longer Graceless mom, but Christian mom. And Emily and Laura are wonderful traveling companions. These are not moms pontificating from on high, but women who know the heat of the moment, the temptations that come with deep trials, and the unexpected pain of legos underfoot. Let their life-giving words point you to Christ crucified and raised to life for sinners. Let them remind you that the light of the Son has dawned and you walk in the warmth of a risen motherhood." "THIS BOOK IS A BREATH OF ETERNALLY FRESH AIR."